Yona has been producing for many years its own pita bread, we are known for our high quality breads made ​​with natural ingredients. 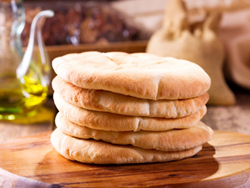 We mainly supply our pita breads to restaurants and retailers. Yona pita breads are also Kosher and biologically available . Gas packed pita breads are 3 months valid. The frozen packages are 12 months after production date .